Today: The delicate green with a not-so-delicate flavor. Watercress is one of the oldest leafy greens consumed by humans, and like so many other vegetables, it has had its fair share of purported benefits throughout the years. In 75 Exceptional Herbs, Jack Staub says that the vitamin and nutrient content of watercress and other cresses meant that, historically, they were thought to boost brain power—hence an ancient Greek proverb urging to “eat cress, and learn more wit.” But perhaps the best claim comes from Francis Bacon at the turn of the seventeenth century. The English philosopher and scientist said: “The eating of watercress doth restore the wanted bloom to the cheeks of old-young ladies.” What's next? An anti-aging cream with watercress extract? 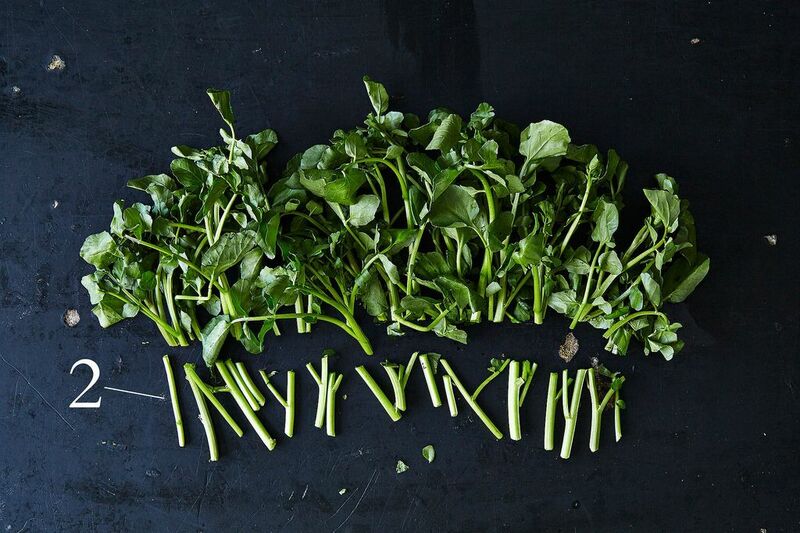 A taste of wild watercress from the farmers market might have you hooked. 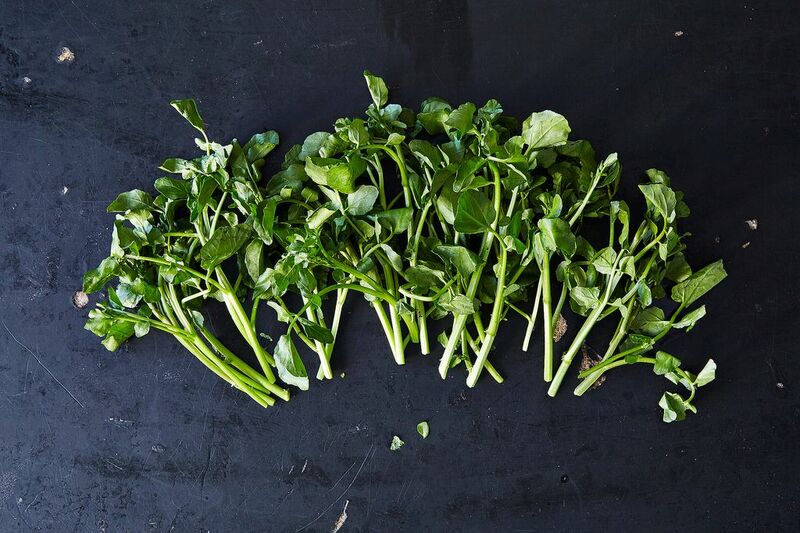 If you get the urge to start foraging, resist it: It’s best to leave the procuring of wild watercress to the experts. 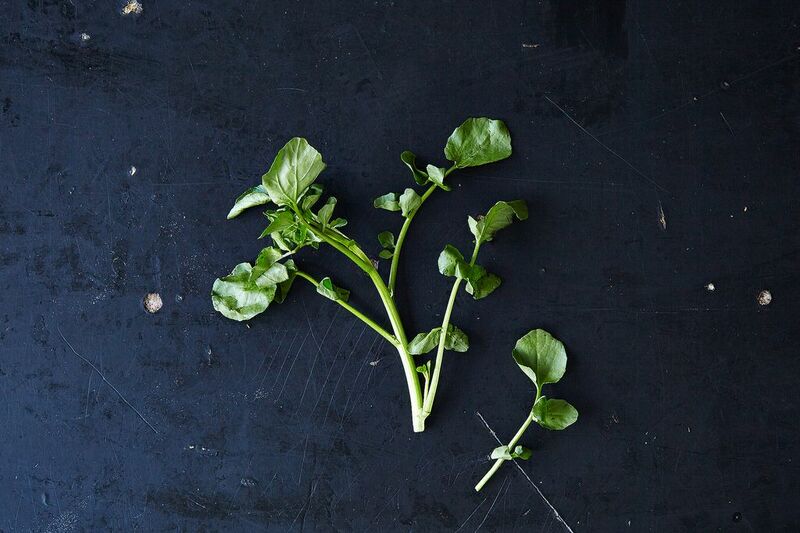 Author and food critic Florence Fabricant shares a lesson learned from Andy Brown, a partner at B&W Quality Growers, the world’s largest grower of watercress: “Eating wild watercress can be as risky as nibbling a foraged mushroom. It’s not the watercress, he said; it’s the environment. To be safe, the plants, which actually grow in water, must be right at the source of a spring before it can be contaminated by parasites carried by tiny snails or livestock or other animals. In some areas, wild cress may also absorb high levels of heavy metals, like copper.” Note that this caution applies to foraging for wild watercress, not to the watercress you buy in a store. More: Learn more about where the wild foods are—and what to do with them. Most watercress that you pick up at the grocery store will have large, round leaves (1). Look for dark green, perky bunches of watercress, and avoid any that are yellowing, wilting, or slimy. Pair watercress with seafood like squid, trout, sardines, or tuna. Its peppery nature mixes well with meat, too. Try Amanda Hesser’s All-in-One Salad with lamb, chicken, and salumi, or stick to one meat at a time and use watercress in a grilled flank steak salad. Blend it into a sauce or soup. Or, make a watercress purée. Fun fact: The first time Amanda’s then boyfriend, now husband cooked dinner for her, he made a purée of peas and watercress. More: Anxious to hear more? Read Cooking for Mr. Latte for more of Amanda Hesser's love story. Use watercress to make pesto, and then put that pesto on a pizza. Add it to noodle dishes, like pad Thai. Add watercress to any green salad, or let it be the sole green in the salad, like in Maricel E. Presilla’s Cuban Avocado, Watercress, and Pineapple Salad. Watercress makes a great addition to pasta salads, too. Use watercress in the green sauce for Oysters Rockefeller. Try using watercress in your next juice blend. You'll want to keep using watercress once warmer weather arrives, too. Come summertime, pair watercress with corn, melon, and peaches. Tell us: How do you like to use watercress? I have been making watercress soup and watercress/pear soup since the early 80's. Back then it was so difficult to find. Now you can find it bagged anywhere. I still prefer to get it fresh from the organic market when I can get there. I rarely leave enough of the first soup for my husband to taste. The one with pear is his favorite. I use it on sandwiches instead of lettuce and, of course, little teatime watercress sandwiches. For me, watercress is both the green and the goddess. Green goddess dressing in a pasta salad is a delight. a simple saute with chopped garlic and a dash of fish sauce tames its bite and transforms it into a savoury side. Yay! So timely, I planted cress seeds on a whim this year and they're just starting to sprout. I've never cooked with it before and now I'll have plenty of ideas. Cress and Watercress are not the same vegetable. They have a similar peppery 'bite' to them. My husband is from the UK - over there cress is used like alfalfa sprouts -as a sandwich filler. Their growth rate and harvest times are also rather different. Good luck with your cress project. I hope it's delicious however you choose to use it. I love it, too! Great as a salad with some poached salmon.